Being an IT Product Owner for a software development company gives me a lot of opportunities in creative ideas and exciting technology, but this has nothing on the love I have for running. My preferred distance is Ultra Running. 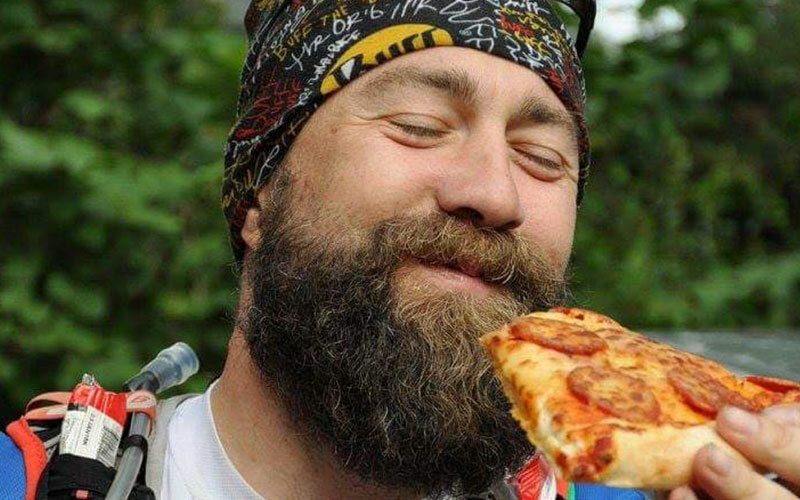 Ultra-marathons take you beyond beating your personal best, they give your more of a mental challenge. Ultra-running has strengthened my mind and given me the belief that I can actually achieve any goal and complete it. 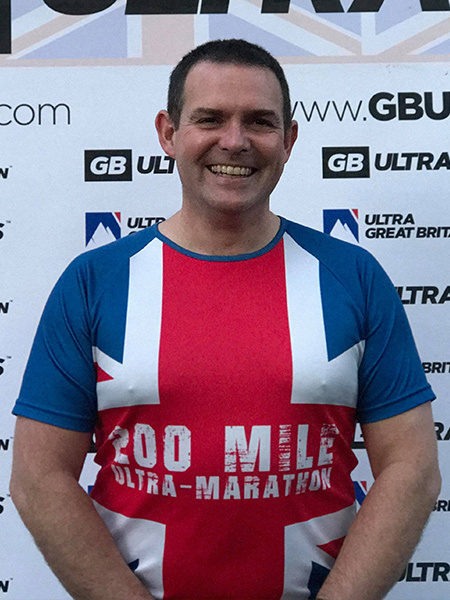 Ultra Great Britain 200 mile 2016event (1st Edition) was personally my favourite event to date. I surprised myself by finishing in 4th place. Taking part in all types of distance running on different terrain is constant motivation for me, from my first race in 2015 all the way up to the present I still think “I just did that”. The running community is beyond amazing how we all support one another and I have found myself some true friends along the way. Being an Ambassador for GB Ultras is beyond a pleasure, I love that GB Ultras shares the passion that runners have. It’s not just a company, it’s a family and I can happily say there is no-one else I would be rather be an Ambassador for. I took up running in 2006 after a New Year’s Eve bet to run a half marathon. Three months later and 3 stone lighter, I went on to complete my first half marathon in a time of 1hr 24mins and a month later I completed my first 10km in 38mins. This newly disciplined lifestyle with training and racing regularly saw me take on my first marathons in 2009 completing2 marathons within 3 weeks, both sub 3hrs15mins. In 2011 I then cycled from John O’Groats to Land’sEnd in 13 days and after this I competed the London Marathon with just one day off. 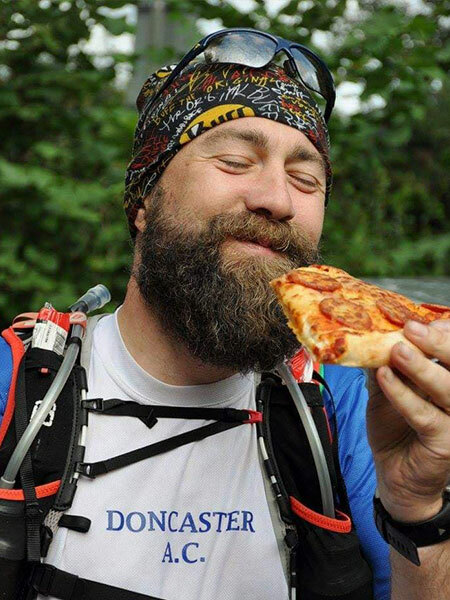 My next natural step was to turn to Ultra Running in 2015, where I completed 3x50km Ultra Marathons and ran the Wainwright 192 mile’s Coast to Coast (self-supported)through the Lake District, North Yorkshire Dales and North Yorkshire Moors in 8 days. In July 2016 I realised my dream of becoming the 1st person to run the full length of Malawi, 708 miles in 27 days raising an incredible £35,354 funding the construction of a Science and Art building for the FOMO secondary school, a charity in southern Malawi supporting orphans. To end an incredible year, on returning from Malawi, IranJohn O’Groats to Land’s End in 35 days. 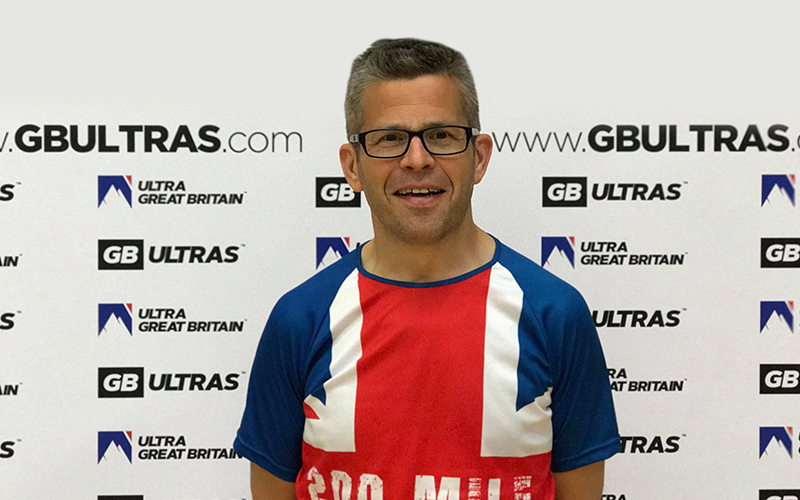 In 2017 I completed Ultra Great Britain 200Miles, the Race Across Great Britain, finishing in 80 hours as part of my preparation to Run Across Africa. 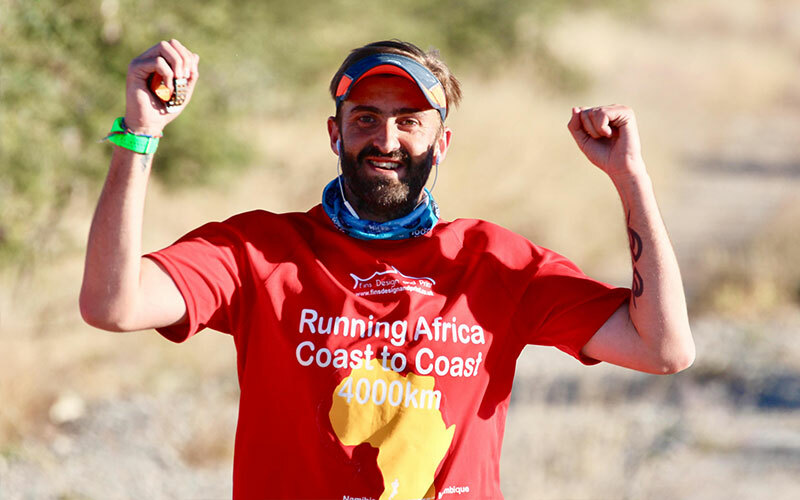 All my training and racing since 2006 has proved perfect prep for my dream ofRunning Across Africa. 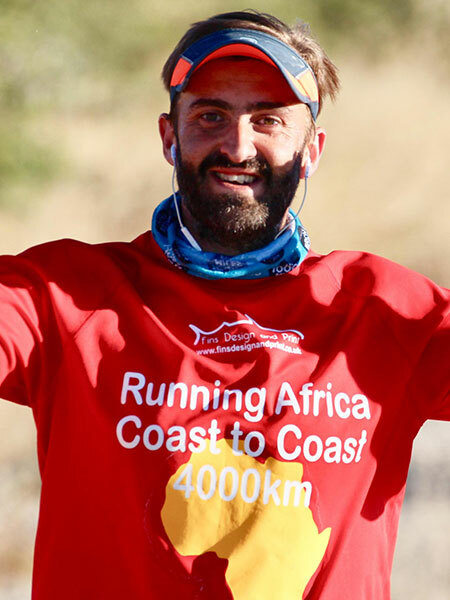 And soon the 8th September 2018 Iran into the Indian Ocean completing the epic 4000km Run Across Africa fromNamibia to Mozambique meanwhile continuing the fundraising for Friends of Mulanje Orphanstakingthe amount raised for charity to over £80,000throughout the years, andI will be hoping to announce my biggest challenge to date at The National Running Show in January2019. Being asked to be Ambassador for GB Ultras was a bit of shock to be honest. I have my own small company and predominantly work within the architectural metal work industry but I have always been drawn to the outdoors. My love for the outdoors I owe to my parents who would take my sister and me to Scotland and Wales for many family holidays, from this I joined the Long Distance Walking Association and have done many events with them. 10 years ago was a turning point in my running journey, running races regularly andI soon talked myself and two of my friends into taking part in the Liverpool Half Marathon. After separating from my friends during the race, I was surprised to have finished in a time of 1hr and 48mins. My running journey continued when I re-entered the following year and completed in 1hr and 45mins and then followed this up by completing 52 events in 52 weeks to raise money for a local charity. 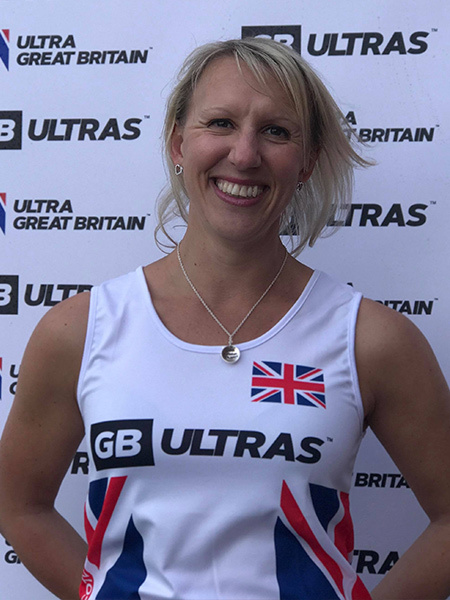 Nowadays,I get more enjoyment out of events by being a volunteer and now that I’ma GB UltrasAmbassador I hope I can really help runners who are struggling getting past that wall all us runners face by having a friendly face and plenty of humour, alongside a friendly hug and chit chat. I’m there first thing and one of the last to leave. Within my day-to-day job I work with children who have complex needs, I sleep at the children’s home 3 days a week. Trying to find the right balance of work, life and training has been a real challenge in itself. I’m also a family man with4 children and 1 grandchild. I have a great passion for Ultra Running and I am Ultra Running Captain at Doncaster AC. 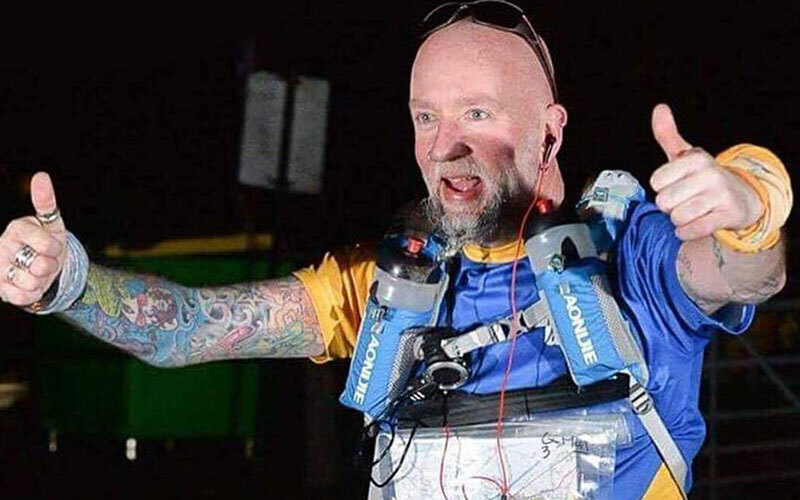 When I was made redundant from 2 jobs this freed up a lot of my time and I fell in love with running, I then took on a role as support crew for a World Record attempt. This was to raise money for Brain Tumour UK by completing the most back to back Marathons by a group of people. Over the 18 days I did my first marathon unintentionally, I ran more hours than I slept! 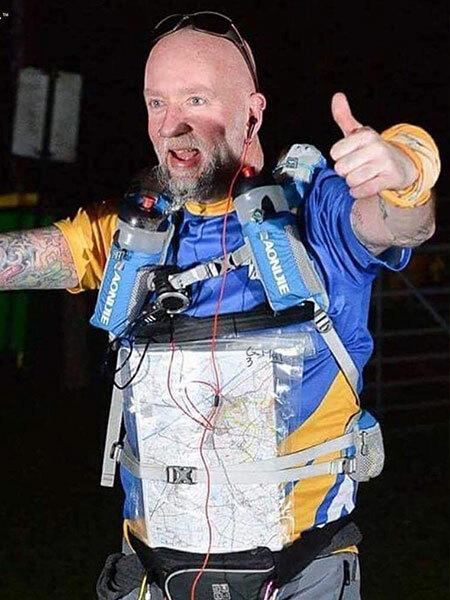 It made me think “what can my body actually achieve if I had the right mind set and training” so this led me to my journey, since then I have ran 12hr, 24hr and Ultras from 50 miles up to my biggest achievement to date, the 2017 Ultra Great Britain 200Mile Race where I won the 3rd Male trophy. Mountains, Hills, Forestsand Countryside running really helps me clear my mind and I’m really looking forward to the future as an Ambassador and taking on the Race Across Scotland 2019 (4th Edition). In 2009 I trained for a whole year to complete my first marathon, the LondonMarathon. I then completed the London Marathon for the next 3 years and it then felt to me that a marathon didn’t seem so daunting, so I started entering more each year. In 2016 I had completed 47 Marathons which saw me reach the accolade of 52 Marathons in 52 weeks. This then led to a very special moment for me, as I finished my 100th Marathon on the 24th June 2017. 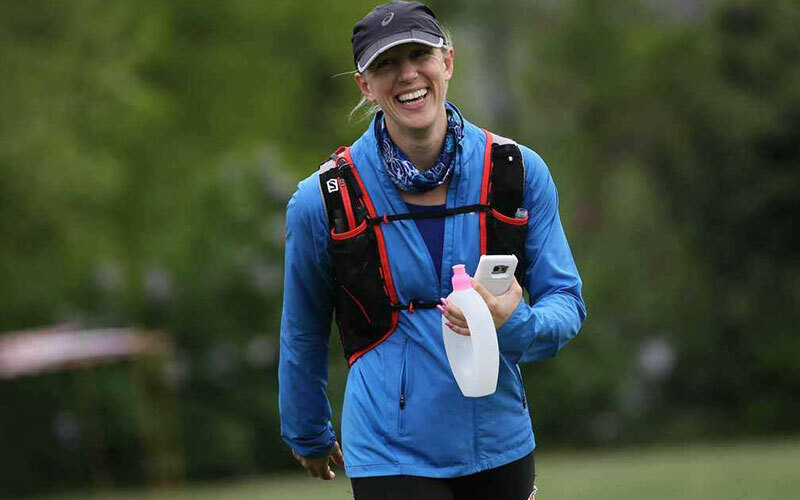 I started the process and transition into becoming an accomplished ultrarunner in 2018when I decided thatI would push myself to my limits. 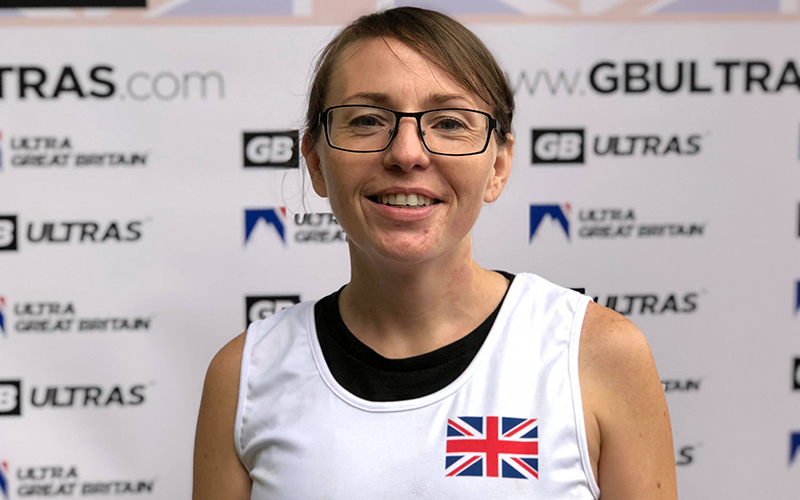 Going from completing 26.2 mile Marathons’ to completing the Ultra GB, Race Across Scotland 215 Mile Ultra-Marathon in an amazing 87hr and 54mins!! I was beyond grateful to be apart of such a beautiful experience. Running has truly changed me as a person, its not only given me physical strength but mental strength too. 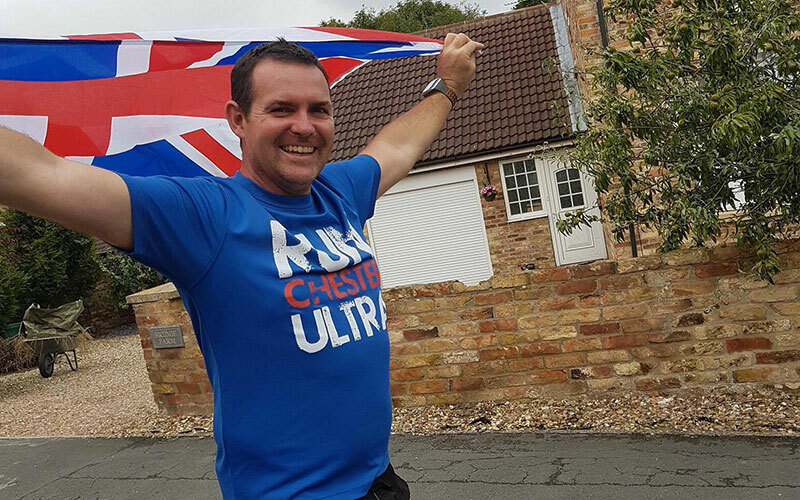 Being part of a running community is so positive and being an Ambassador for Ultra Great Britain is such an honour. To be able to represent a sport and a company which you feel so passionately about is a privilege. Being there to help other people achieve their goals and dreams is just amazing and I hope to be a part of this forever. I’m a manager for a children’s charity, and although it can be challenging,I do love my job. The best part is working with the children to make sure their voices are heard. I would say when it comes to running I’m definitely drawn more to longer distances, because I enjoy the challenge. I have a new found love for mountain running so I have to say my favourite GB UltrasRace is Pennine Barrier. It has very beautiful, varied terrain, and the Race combines trail and fell running perfectly. I’ve completed Ultra Great Britain 200 Mile event Race Across Great Britain in 2017 after learning so much with a DNF in the 2016 Race. If I can complete a 200 mile event after a DNF then anyone can do any ultra mile distance if they put there mind to it. And if I can help in any way from supporting, to being a marshal, to giving advice from the side lines or picking you up with a friendly smile and hug thenI’ll do it, that’s why I love being an Ambassador. I’m a director of a company called Physio Matters Neurological Ltd and manage a team of physiotherapists. I’m a neurological physiotherapist and work with people who have conditions such as traumatic brain injuries, stroke, multiple sclerosis and spinal cord injuries. I love my job and incorporate many recreational and sport activities into rehabilitation and this is where my love of running works alongside my job. 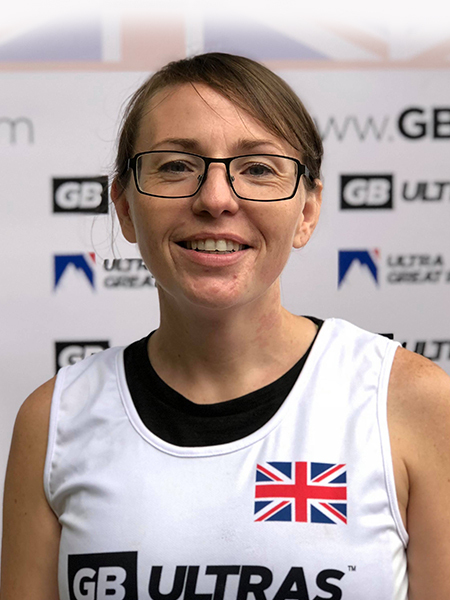 I joined Royton Road Runners and have ran marathons in the UK, Europe and US. I then turned my head to Ultra-marathons as many of my friends were entering. In 2016, I completed the Hardcastle 12 hour race with 47 miles. I jumped straight up to Ultra Great Britain 200 Mile Race in 2016 (1st Edition) and that was where my Ultra journey truly began. What I love about Ultra Running is the support you receive, after entering The Spine I broke my rib 70 miles in, I then used Chester 100 as my comeback. I’ve also helped marshal at the top of Snowdon on the 1st Edition of the Snowdon Ultra 50/100. I’m so please to be able to say I have completed all threeUltra Great Britain 200+ Mile events which I consider to be a great achievement. 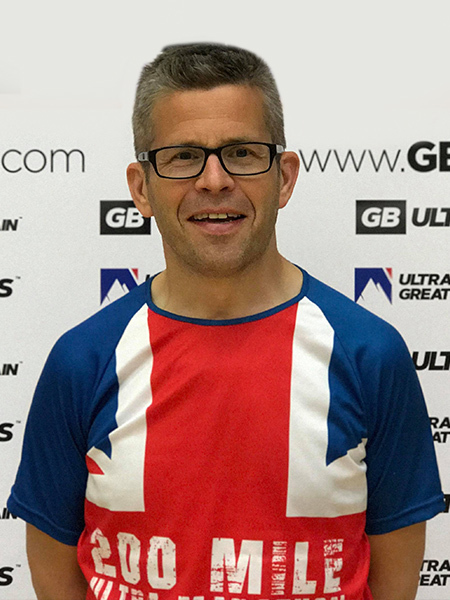 My running goals are to continue to enter as many Ultra Great Britain Race Series events as possible whether it be as a runner or marshal, and to finally complete The Spine.